The first Audi quattro, which debuted in spring 1980, was a technical sensation. Its permanent all-wheel drive was lightweight, compact and nearly stress-free. 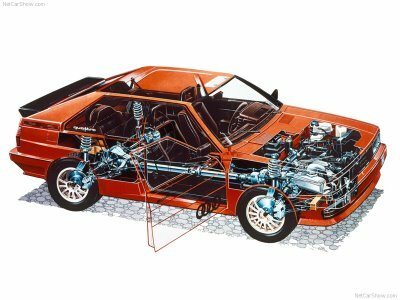 The elegant quattro principle did not need the heavy, separate transfer case and weighty auxiliary shaft to the front axle that were the standard at the time. It was the first permanent all-wheel drive system suitable for fast and sporty cars produced in volume. developed by the then development director Dr. Ferdinand Piëch, was a 263 millimeter (10.35 in) drilled out secondary shaft in the gearbox through which power flowed in two directions. At the rear end, the hollow shaft drove the housing of the slim center differential, which was flanged directly to the shaft. Designed with a classic bevel gear layout, it sent 50 percent of the torque to the rear axle via the prop shaft in every driving situation. The other half of the power was transferred to the front axle’s differential along an output shaft rotating inside the hollow secondary shaft. a bit of a handicap on slippery surfaces. The amount of power that could be transferred was limited by the axle with the lesser traction. To remedy this, the driver of the Audi quattro could manually lock both the center and the rear axle differential. Initially this was done via two Bowden cable levers between the front seats, but Audi switched to pneumatic activation via switches on the dashboard in 1981. The anti-lock brake system (ABS), which was used in production cars starting in 1983, could not be active due to the rigid drive shaft, however. With the debut of the Audi 80 quattro in fall 1986, Audi introduced a new center differential – a component that was still strictly mechanical, but highly efficient. The name Torsen was a contraction of the English words “torque” and “sensing.” The Torsen differential had already proved itself in the world of technology as a high-tech rear axle differential; Audi developed it further for use as a center differential. The innovative feature of the Torsen differential was its arrangement of helical gears with special teeth cut at an angle to the gear axis. 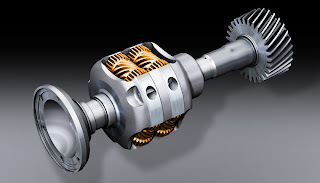 The two side gears on the ends of the drive shafts leading to the front and rear axles are each in mesh with three roller-shaped satellite gears; these are arranged in pairs in a triangle formation around the side gears and each pair is interconnected via meshing spur gears. If the wheels of one axle cannot transmit the torque supplied, this creates friction in the helical gear train. The helical gears instantly and steplessly redirect the torque to the other axle. The standard distribution was still 50:50, but, when needed, up to 75 percent flowed to the axle that had the better traction. 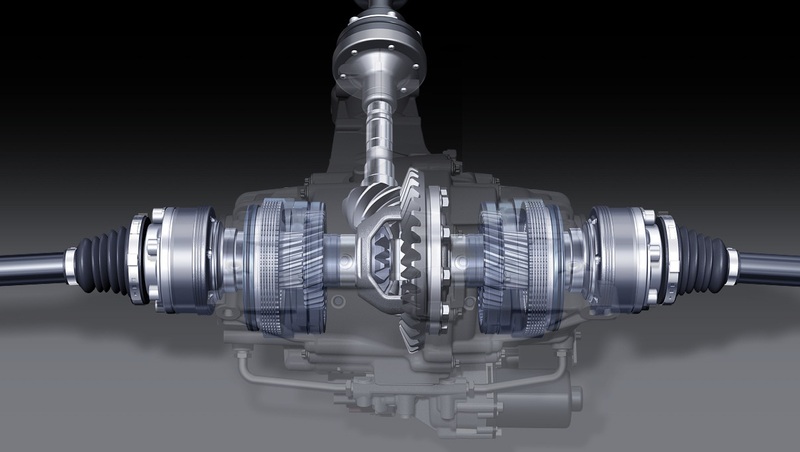 The Torsen differential locked only when under load. The differential was unlocked as soon as the driver took his or her foot of the gas, thus the ABS was always functional when it was needed. To further improve traction when starting under extreme conditions, the driver could still lock the rear axle differential electro-pneumatically at the push of a button. The self-locking center differential in the classic quattro power-train does an excellent job of distributing the power between the axles. To make driving even more dynamic, it needs an additional component that actively splits the torque between the wheels of the rear axle. Audi presented this solution in the new S4 in late 2008 – the sport differential. 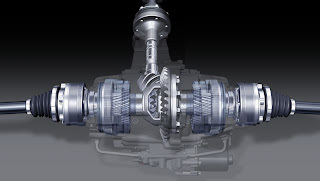 The sport differential is a state-of-the-art rear differential. gear was mounted on the left and the right of a conventional rear differential. It turns 10 percent faster than the drive shaft. shaft and the superposition gear. When the clutch closes, it steplessly forces the higher speed of the superposition stage on the gear. Being forced to turn faster results in the additional torque required to do this being drawn off from the opposing wheel on the inside of the curve via the differential. In this way nearly all of the torque can be directed to one wheel. The maximum difference between the wheels is 1,800 Nm (1,327.61 lb-ft). The sport differential is just as effective while coasting as it is under load. It is electronically controlled and reacts within a few hundredths of a second. Audi developed the software itself. The controller quickly and constantly recalculates the ideal distribution of the forces for each driving situation as a function of the steering angle, yaw angle, lateral acceleration, speed and other information. Vehicles with conventional axle drives tend to understeer in fast corners. With the sport differential, it is like riding on rails. When turning into or accelerating in a curve, the majority of the torque is directed to the outside wheel, pushing the car into the curve. The system thus nips any tendency toward oversteer or under-steer in the bud.